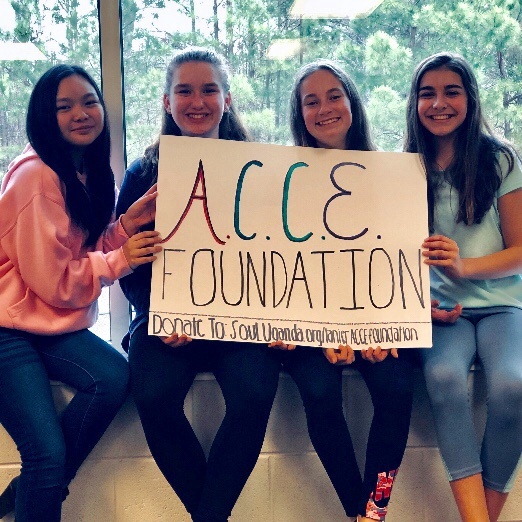 Four students at Lanier Middle School in Buford, Georgia, are raising funds to send FIVE female primary students (1st - 7th grade) in Uganda to school for one year. The ACCE Foundation has asked for your help to send five girls to school for a year in Uganda. Our total goal is approximately $1,320 ($22 a month for each student). The reason we chose S.O.U.L. Uganda to help us with this mission is because we believe that they actually care about the people there. The S.O.U.L. part stands for Supporting Opportunities for Ugandans to Learn. This is important because education is our top priority in the ACCE Foundation. We chose education because we believe that it is the foundation to many things like literacy rate, unemployment rate, famine, etc. The reason we chose to fund-raise for five girl is because girls have less advantages than boys do. Learn more about S.O.U.L.’s education programs here. Donate to ACCE Foundation’s fundraiser below! S.O.U.L. Foundation will not share your information with any outside parties and will only be used to follow-up regarding your tax-deductible donation.